August 22, 2015 on a train going from Amsterdam to Paris, 3 U.S servicemen and long time friends took down an armed terrorist. Anthony Sadler, a Sacramento State senior, along with Oregon National Guard specialist Alek Skarlatos and U.S. Airman Spencer Stone earned worldwide praise when they took down an armed gunman on a train. Sadler told the national news that him and his friends were asleep when they heard gunfire and breaking of glass. They woke up to find a terrorist with a handgun and assault rifle a few rows ahead. 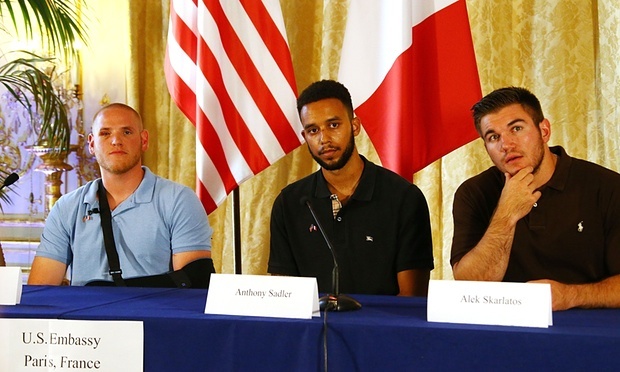 Alek Skarlatos said Anthony Sadler rushed the gunman along with the two others as Anthony got the terrorist to the ground. “And then,” Alek says, “we just did whatever we could to disarm him.” As the three were bringing the man to the ground, the terrorist pulled the trigger to shoot at Alek, but the gun did not fire. Nobody was harmed. The men were recognized by the French government. They were given the nation’s highest honor, the Legion d’Honneur. Also, President Barack Obama personally called the men to congratulate and thank them on their heroic acts.Other nations worldwide have also recognized the mens heroic acts, and awarded them. September 9, 2015 in News, Travel. New Chinese School or New Human Rights Concern?